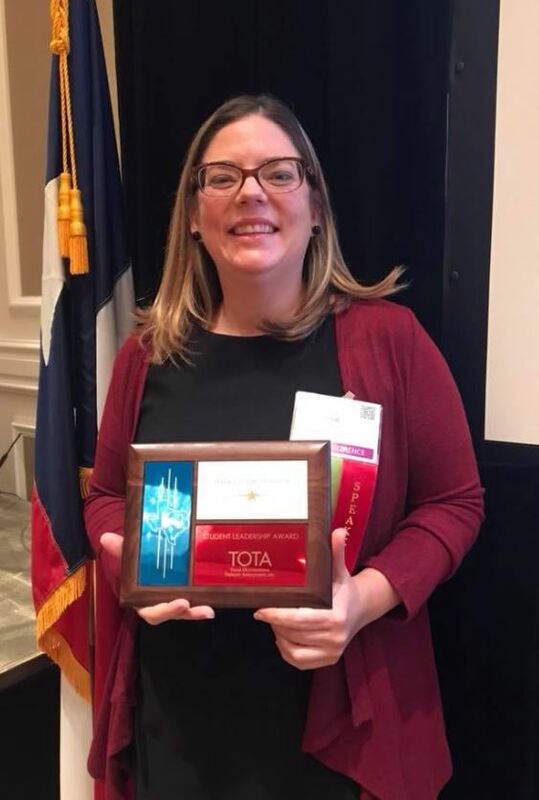 Amy Honeck, a MOTIII student, was awarded the Student Leadership Award by the Texas Occupational Therapy Association (TOTA) at the Annual TOTA Mountain Central Conference held in Sugarland, Texas on November 2 – 4, 2018. Amy’s talents, leadership abilities, and tireless advocacy to promote the profession of occupational therapy was recognized through the highest distinction awarded by TOTA to occupational therapy students. During her initial semester at UT Health San Antonio, Amy was elected by her peers to serve as the Student Occupational Therapy Association’s TOTA State Representative and immediately distinguished herself as an invested and caring leader. Amy actively represented SOTA on the Alamo South District board and once she understood the importance of student representation she identified that she would love to represent all of the graduate students in Texas by serving as the OT student representative for TOTA. Amy—on top of her rigorous course schedule—has provided over 300 hours of volunteer service at organizations that include, Habitat for Humanity, Ronald McDonald House, Morgan’s Inspiration Island, Crossfit Kids, Roy Mass, Regina Caeli Academy, and has contributed her efforts to the success of many community events in San Antonio. She initiated year-long community service learning project to improve the physical and mental health of individuals served at Clubhouse of San Antonio. She also participated in Makeathon at Vanderbilt University, a unique and innovative event sponsored by Tikkun Olam Makers. This is a global movement that matches engineers, designers, therapists, carpenters, innovators, and others with specific needs of people living with disabilities. Amy has also presented at numerous conference including the 2017 Texas Health Literacy Conference, 2018 AOTA Annual Conference, 2018 Texas Society of Allied Health Professionals Conference, and the 2018 TOTA Mountain Central Conference. She has been recognized by the UT Health San Antonio OT Department for her contributions to departmental research, was inducted into the Alpha Eta National Honor Society for Allied Health Students, and received the Baptist Health Foundation Scholarship for 2017-2018. Amy’s participation in community projects, active involvement as a leader, and participation and advocacy for the profession of occupational therapy have positively affects the lives of individuals within the San Antonio community, her peers, and the profession.